I’m thinking about creating a Yelp account for my 91 year-old dad. 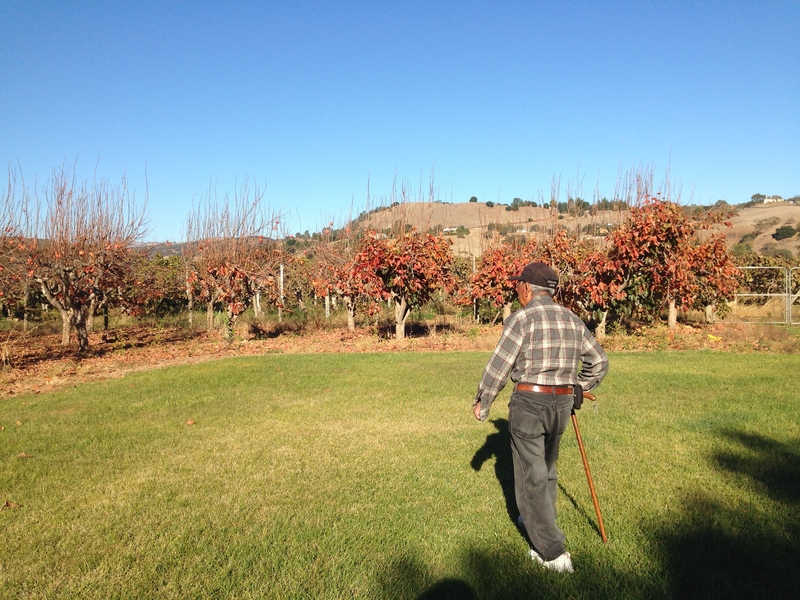 oldyelper prepares to review the persimmon trees. Those poor persimmons don’t stand a chance. “The meat is soft.” What he’s trying to say: Tender! And I don’t have to chew that much. Readers can look forward to going to that unnamed restaurant and asking the wait staff for the whatchgall that oldyelper ordered the other night. This broke my heart a little because my dad was talking about a hard shell taco with “American” cheese, iceberg lettuce and flavorless tomatoes. You can’t teach an elderly dad many new tricks. Believe me, I’ve tried when it comes to Mexican food. I wanted to convert him to the deliciousness of carnitas and *lengua and mole, and different styles based on different regions. Expand his palate. I thought at the very least that I could get him to use the word salsa instead of “sauce” and “dip”. We must have tried at least a dozen different Mexican restaurants (including bastardized versions), but oldyelper was never impressed. One night I decided to make the tacos my mom used to make when my brother and I were younger; the only kind of tacos to which my dad could relate: store bought hard shells, McCormick taco seasoning, ground beef, shredded Romaine (don’t tell him it wasn’t Iceberg) and homegrown tomatoes. 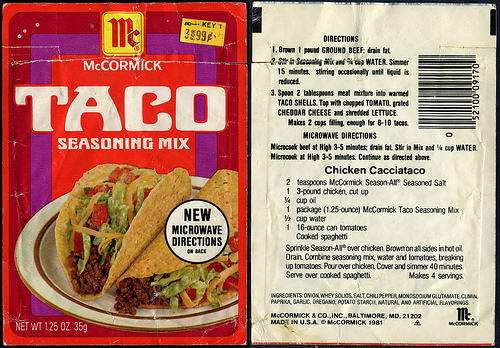 this is old school seasoning, yo. As I was sprinkling the seasoning on the meat, my mainly Japanese-speaking mom said, “Smells taco.” Yup. Smells taco. Just like she remembered. That night, oldyelper gave me this review: “Good!” And then he helped himself to another taco. It eased some of the pain. What can I say? I’m a sucker for a good review. *I gave my dad a lengua burrito once and told him it was beef. It wasn’t a complete lie. What?? Like you’ve never lied to someone about something that’s for their own good?? Haha, this made me laugh! Oldyelper is very cute. I think he should have a blog and just review all sorts of things. The other day my Pop asked what I wanted for dinner, I said some good tacos. I got Taco Bell tacos without any “dips”. I thought “really” there’s like 20 Mexican restaurants in our area and Taco Bell! I’ve tried introducing Thai food to my dads pallet or “thigh” food as he calls it and it rarely works out. Parents! So you can relate!! OMG, that’s so funny. How could he forget the dip!? I see…you’ve attempted Thigh food. I think we gave my dad some Thigh leftovers once and just called it “noodles”. This kind of lying seems to work well. How about I buy you an almost beef burrito?? Your Dad is a treasure. Of course it makes sense say “soft” meat. Oh, love the word Whatchgall! Don’t you dare start using that word! !